Last Sunday my friend G and I crawled out of bed at 3:30am. For summer mountain/desert flying, the early bird gets the worm. By 5am we were on our way, 6am refueling at the 'last services' at Daggett airport. 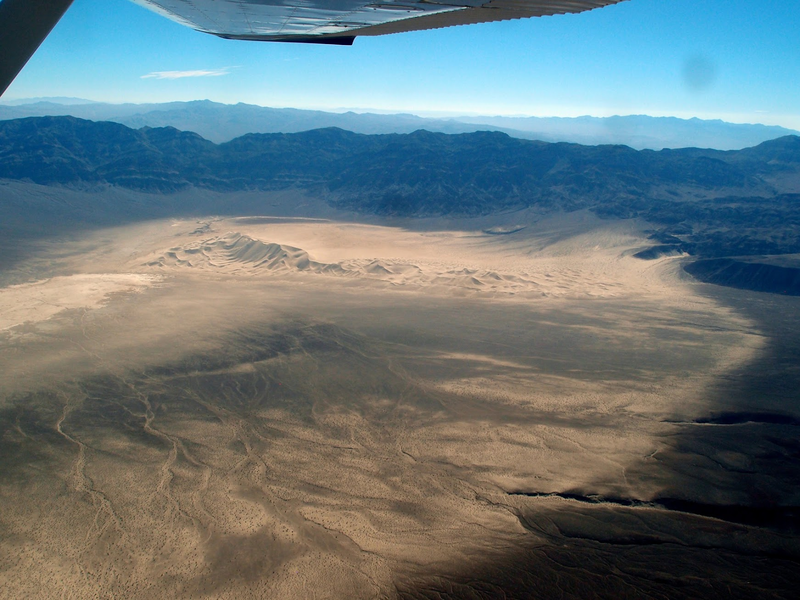 Not long after we turned left at Baker and proceeded to fly through every single valley in the Eastern Sierra Fault Zone. Our route took us up the Amargosa valley past Tecopa, Shoshone, and Death Valley Junction, cut down over Zabriskie point, Badwater, and Furnace Creek, passed Salt Creek, the Mesquite dunes, Stovepipe Wells, Scotty's Castle, Ubehebe Crater, Tea Kettle Junction, and Racetrack Playa. Here I demolished a Clif Bar as we dropped into Saline Valley. We flew over the Chicken Strip and hot springs, cruised up the Eureka Valley, turned left into Deep Springs Valley, and saw the remains of the Alma radio telescope. Before us the Sierras loomed to 14000 feet, and the Wacoba lake beds shored up the Inyo/White Mountains. 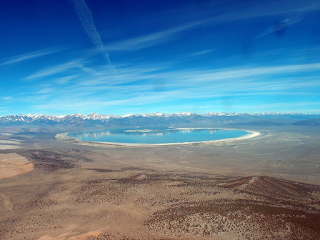 We passed Bishop, Hamill, and crossed over to the Mono Basin at 10,500 feet above sea level. We continued north until Bridgeport and Bodie were in view, then turned back south into the only headwind of the whole flight, crossing into the Long Valley Caldera with the Mono craters on our right, checking out the various hot creeks and landing at Mammoth Yosemite Airport, right beneath the awe inspiring Convict Lake roof pendant. We watered the thirsty bird and once more took to the air, passing Lake Crowley and Bishop, then cruising down the Owen's valley past Big Pine, Independence, Manzanar, Lone Pine, and Owen's Lake. Here we turned left, crossed the Darwin Plateau, and flew the length of the Panamint Valley. With a quick diversion to check the state of the road connecting to Death Valley south of Telescope Peak, we popped over into the Trona valley, cruised past the pans and the pinnacles, before climbing up over the Edwards AFB restricted area and setting course for home. Once over Santa Anita racetrack I idled the engine and practiced a glide back to the airport, landing just a few minutes after 2pm, with 16.8g of fuel remaining. I have been planning to do this flight for more than a year - finally the weather was just right: clear, and calm, to do the entire thing in one go. All I need now is a faster plane!